Back on September 11th 2001, terrorists flew two fully fueled planes into the World Trade Center. The result was catastrophic and forced people to jump to their death before eventually both buildings collapsed. I was there that day to experience it first hand. Other than proving that humans have a lot more evolving to do, the chaos it caused made a lot more people than usual use their cell phones. Because too many people were trying to make calls, the cellular towers in the area of the World Trade Center became saturated and a large portion of the voice calls could not be placed successfully. On that day I had a RIM 857 (a BlackBerry). Back in 2001, BlackBerry (RIM) had no phones and operated on dedicated data networks. The two that RIM devices used were the Mobitex network run by Bell South in the United States (which was later absorbed into AT&T Wireless), and the DataTAC network run by Motient in the United States. These networks were available in a few other countries including Canada and Australia although the RIM devices were only used in the US and Canada. Because my BlackBerry operated on a completely isolated network, I was freely able to send and receive emails, while the cellular networks were completed jammed with voice calls. (In a related note, if you want to read my account - which is essentially the thread of emails I was sending and receiving on my BlackBerry in real-time that day - click here. Its kind of chilling to re-read it). Actually there were 2 reasons. The first was because of a separated network, but because the BlackBerry has always used a store and forward approach to data, even if there was congestion on that network, it would have simply kept retrying until that packet of data was sent. So on that day I was able to communicate with work colleagues, friends, and family, while others using regular cell phones were not. The very next year, the first GSM BlackBerrys started shipping, the 5810 and 5820. Both had a phone, and sent data using the GSM cellular network, making use of a technology called GPRS (General Packet Radio Service). Many people worried that the huge benefit of using their BlackBerrys on 9/11 would be lost as the data part of BlackBerry moved to the same cellular network that carries voice calls. But as it turns out, it wasn't. Here is why. Why does the data get through? We recently saw that after the earthquake in Haiti, people were using BlackBerry Messenger to communicate, while others trying to make regular cell phone calls, could not get connected. Why would that be? Surely if a cell tower is not able to allow more calls, how can data get through? The answer lies in the way in which the cells handle voice and data. Because radio spectrum is limited, cellular carriers had to come up with a way to share the smallest amount of radio spectrum with the largest number of simultaneous connections. There are 2 main ways to achieve this (there are others but these are just the most widely used). 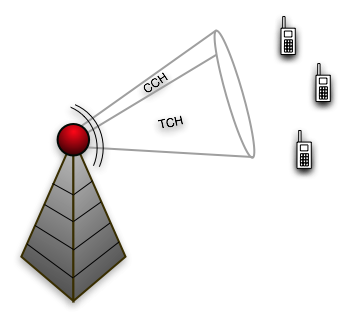 Code Division Multiple Access (CDMA) takes a spectrum of bandwidth, and uses unique codes to identify each phone that connects. This means that all phones use the same frequency range (or bandwidth) at the same time, while the code they use when transmitting allows them to be distinguished (think all the people in a room talking at once, but in different languages). Time Division Multiple Access (TDMA) is a method of sharing a spectrum of bandwidth by breaking it up into time slots. When a phone connects it is given a time slot. In a round robin fashion, each phone is then given a time to send a burst of data in its time slot (think all the people in a room taking turns to speak). GSM, which is used by 75% of the world, uses TDMA mixed with another technology called FDMA (Frequency Division Multiple Access), while carriers like Verizon and Sprint in the US use CDMA. No matter what technology is used, the bandwidth is shared somehow. When you make a voice call, your voice is converted to data. When your phone connects to a cell tower for a voice call, your phone needs to send data at a speed of around 13kbps for the outgoing audio, and receive data at that same speed for the incoming audio. This causes it (in the case of GSM) to take 2 time slots for the duration of the call. If the cell tower runs out of time slots, your call will not go through. Regular data traffic however is different. This includes email, BlackBerry Messenger, web browsing, etc. The phone and cell tower handle data as the Internet does. It breaks it up into packets. When your phone needs to send an email, firstly the BlackBerry compresses it to half its size (so for example a 2K email [which by the way is a pretty long email] ends up at 1K before it is sent), but your phone then only needs 1 time slot for a very short period of time to actually send the email. Imagine that a voice call is a constant 13kbps on 2 time slots. Your data is tiny in comparison, and takes only 1 time slot for the briefest of time. BlackBerry Messenger is even less data. So in a large congested area, where many people are taking up time slots for extended periods of time, your BlackBerry is able to quickly zap out that data in between people hanging up and making the next call, or using leftover time slots. It is still possible to have absolutely no time slots available if there are many voice calls and many data devices using a cell tower and that's where the second feature comes into play, the store and forward. Even if time slots are hard to come by, your BlackBerry will keep retrying to send that data. Eventually it will get it out, even if it takes so long that you get the red X and have to do a resend. So the moral of the story is, if you find yourself in an emergency situation, try and use data (email, BBM, PIN), instead of a voice call to communicate. Not only will it allow you to communicate, but it will allow more people to communicate at once.